The Au Sable Point Lighthouse was built in 1874 to fill the gap between the Grand Island and Whitefish Point lighthouses. An eighty-seven-foot (26.5m) brick tower was built on a rise putting the light about 150 feet (45.7m) above Lake Superior’s surface. If you take the tour during the summer, you can get an an amazing view of the Grand Sable Dunes from the top of the light tower. This lighthouse steers ships away from a mix of dangerous conditions. There is a shallow sandstone reef extends nearly a mile into Lake Superior off Au Sable Point, and in places the reef lies only a few feet below the surface of the water. Add to that the thick fog that was caused by the cool lake air mixing with the warmer currents rising from the Grand Sable Dunes. Before the lighthouse was built these conditions claimed dozens of ships during the early shipping days when keeping land in sight was the main navigational method. The Au Sable Lighthouse was one of the most remote mainland light stations in America with the nearest town of Grand Marais was more than 12 miles (19km) away –but there was no road to it. Lighthouse keepers had to either get there by boat or hike the 12 miles (19km) to Grand Marais. 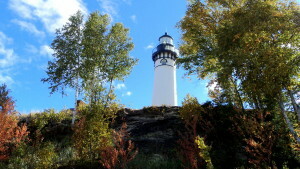 The Coast Guard automated the light in 1958, and later turned the property and buildings over to the National Park Service to be part of the Pictured Rocks National Lakeshore. From Grand Marais, Michigan drive west on Alger County Road (H-58) for 9.7 miles (15.6km) then turn right into the Hurricane River Campground. When you reach the Hurricane River Campground, park near the Hurricane River. Even today the Au Sable Point Lighthouse is one of the least accessible mainland light stations in the United States and you still cannot drive right to the lighthouse. Just as its keepers once did, you must walk to it, but you only have to hike only 1.5 miles (2.4 km). You can follow the trail that starts near the hurricane river all the way to the lighthouse, or at the first opportunity, you can head down to the shore and walk along the beach the rest of the way. The first wreck is the oldest of the three along this trail. It was called the Mary Jarecki and it lies just outside the campground. The Mary Jarecki was a wooden bulk freight steam barge of 645 tons, 200 feet in length. It grounded on Au Sable Reef and went down on July 4, 1883. The ship was lost in heavy fog and ran into the shallows on the west side of the point. When other boats could free the ship they left it there. The remains are just off shore in Lake Superior and are difficult to see if there is a chop on the lake surface. Hike further down the trail and you will see another “Shipwrecks” sign. The signs indicate that the hulls of two ships are half-buried in the sand. The first is the Sitka, a 1,740-ton wooden bulk steamer, 272 feet long, 40 feet wide which went down on October 4, 1904. The ship was heading from Marquette to Toledo loaded with iron ore when it was hit by a gale and ran aground on Au Sable Point. The Grand Marais Lifesavers rescued the crew of 17. The waves soon broke the Sitka in two and it slid off the rock into deep water and sank. The second is the Gale Staples, a wooden bulk freight steamer of 2,197 tons and 277 feet long, launched in 1888 as the steamer William E. Morley. This large steamer was heading west with a cargo of coal when it was hit by a terrific gale on October 1, 1918. The northwest storm blew the freighter on Au Sable Reef. U.S. Life savers took the crew off before the ship broke up.